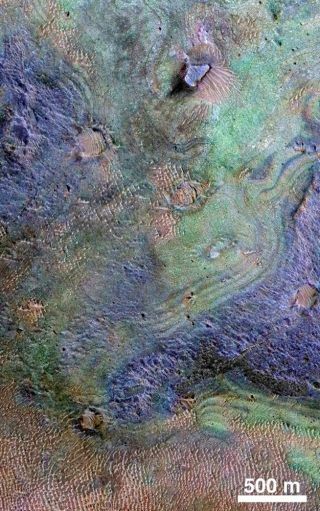 A color-coded composition of a small portion of the largest known carbonate deposit on Mars, the Nili Fossae region. New research suggests there is not enough carbon locked into the surface of the planet to account for the thicker atmosphere thought to exist in the past. The mystery of Mars' missing atmosphere is one big step closer to being solved. A previous hypothesis had suggested that a significant part of the carbon from Mars' atmosphere, which is dominated by carbon dioxide, could have been trapped within rocks via chemical processes. However, new research suggests that there's not enough carbon in deposits on the Red Planet's surface to account for the huge amounts lost from the air over time. "Even if you combine all known carbon reservoirs together, it is still nowhere near enough to sequester the thick atmosphere that has been proposed for the time when there were rivers flowing on the Martian surface," added Ehlmann, who worked with lead author Christopher Edwards, a former Caltech researcher currently with the U.S. Geological Survey. Carbon dioxide can be pulled from the atmosphere via chemical reactions with rocks, forming carbonate minerals. Previous research had suggested that the Red Planet might be covered with significant carbonate deposits, which could have locked up much of Mars' lost atmosphere. But Mars orbiters and rovers have found just a few concentrated carbonate deposits. The largest known carbonate-rich deposit on Mars is the Nili Fossae region, an area at least the size of Delaware and potentially as large as Arizona. Edwards and Ehlmann used data captured by numerous Mars missions — including NASA's Mars Global Surveyor orbiter, Mars Reconnaissance Orbiter, and Mars Odyssey orbiter — to estimate how much carbon is locked into Nili Fossae. Then, they compared that amount to what would be needed to form a dense, carbon-rich atmosphere that could sustain running water on the surface at the time that flowing rivers are thought to have carved extensive valley networks into the planet's surface. The results? More than 35 carbonate deposits the size of Nili Fossae would be required to sequester as much carbon as the Martian atmosphere has probably lost. The Martian surface has been probed extensively by orbiters and landers, revealing only limited and scattered deposits of carbonate. Therefore, Edwards and Ehlmann deem it unlikely that so many large deposits have been overlooked by past examinations. Although very early deposits could be hidden beneath the Martian crust, their existence wouldn't solve the mystery behind the atmosphere that existed when the river-carved valleys formed. So, if the thick atmosphere didn't become locked in carbonate deposits, what happened to it? One possibility is that it might have been lost to space from the top of the atmosphere — a phenomenon that NASA's Curiosity rover has found evidence of in the past. Still, scientists aren't certain how much of that loss occurred before the valleys formed. NASA's MAVEN (Mars Atmosphere and Volatile Evolution) orbiter may help narrow down the mystery as it studies the Martian atmosphere. "Maybe the atmosphere wasn't so thick by the time of valley network formation," Edwards said. "Instead of Mars that was wet and warm, maybe it was cold and wet with an atmosphere that had already thinned. How warm would it need to have been for the valleys to form? Not very." The result could have been a chillier Red Planet. "In most locations, you could have had snow and ice instead of rain," Edwards said. "You just have to nudge above the freezing point to get water to thaw and flow occasionally, and that doesn't require very much atmosphere." The research was published online Aug. 21 in the journal Geology.